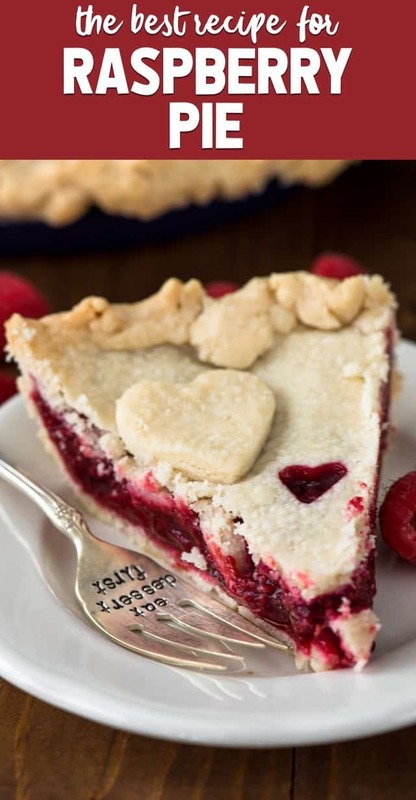 Raspberry Pie is an easy berry pie recipe! Make this pie with a double crust, lattice, or even a crumble topping! It’s such an easy pie recipe. 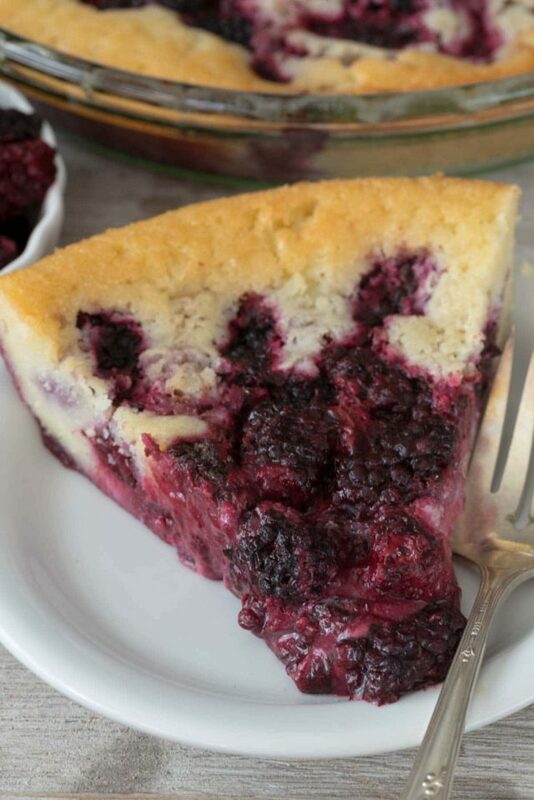 An easy berry pie recipe is something that everyone needs in their recipe box. 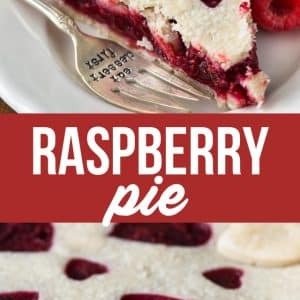 This Raspberry Pie can be that recipe, whether you use raspberries or any of your favorite berry. The best thing about this recipe is that you can use fresh or frozen berries, so if you’re craving Raspberry Pie outside of berry season, don’t worry. You can still make this pie! My goal this month is to get all the basic pie recipes onto this site. I want to be a pie resource, so I need all sorts of pie recipes besides just blueberry, apple, and pecan. Normally when I make a fruit pie, I make a crumble topping, but for this Raspberry Pie I decided to make a double crust instead. The beauty of this pie recipe is that you can use a double crust, lattice, or make a crumble topping. Make whatever kind of pie you love! For as much as I love crust, I don’t have a ton of double crust pie recipes on my site. When I was brainstorming pie recipes, berry pie kept coming up. I had blueberry pie covered but I wanted to do something else that wasn’t just the normal blueberry or blackberry pie. Raspberry pie just seems like the perfect old-fashioned pie recipe, doesn’t it? I can just imagine grandmothers everywhere rolling out pastry and filling the pie with fresh raspberries or frozen from last season. Now, double crust pies are probably the most simple ones to assemble: just plop that second crust right on top the first. But it’s easy to make a decorative double crust pie too, and it’s more fun! How do you make a decorative double crust pie? I’ve seen so many different kinds of decorative pie crusts online but I know that I’m not the best person to try and show off how to braid a lattice or make some sort of elaborate double crust with leaf shaped pie crusts or something. But cookie cutters? That’s something that I can do. How do you make a double crust pie? Like I said, a double crust pie is one of the easiest. You can use refrigerated pie crusts or double my all butter pie crust recipe. Put one crust in the bottom and add your filling. Then, simply lay the second crust over the top and trim and crimp. Tip: make sure you at the very least cut some slits in the top crust to vent the steam, or your crust will bubble and puff. But instead of just cutting slits, you can get creative with cookie cutters. 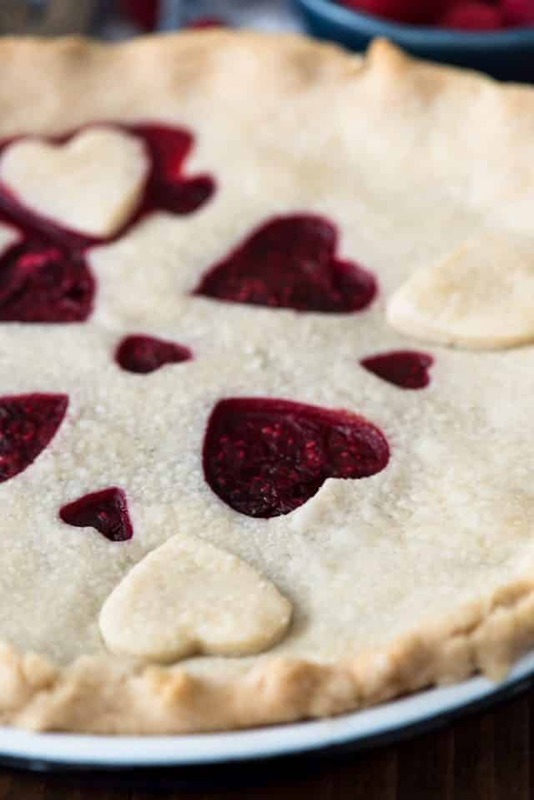 Since I was making a raspberry pie, which is red, it made me think of hearts. I used two different size heart cookie cutters to make the shapes. Watch the video to see how I did it! Raspberries (or any berry), fresh or frozen. If using frozen, make sure they’re thawed and completely drained. Cornstarch for binding. I find cornstarch works best at thickening your pie. This easy raspberry pie recipe is the perfect berry pie for any occasion, no matter what kind of topping you use! Raspberry Pie is an easy berry pie recipe! Make this pie with a double crust, lattice, or even a crumble topping! It's such an easy pie recipe. Carefully stir together raspberries, sugar, lemon juice, and cornstarch. Pour into prepared pie plate. Top the pie by making a lattice (see note) or a double crust pie. If using a double crust pie, be sure to cut holes in the top to vent during baking. 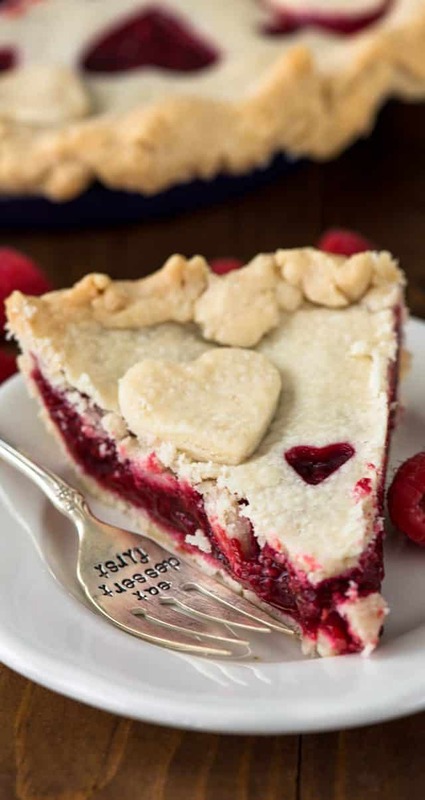 If desired, cut shapes out of the top pie crust using a cookie cutter (such as a heart, as in the photos). Blueberry Pie uses a lattice crust! 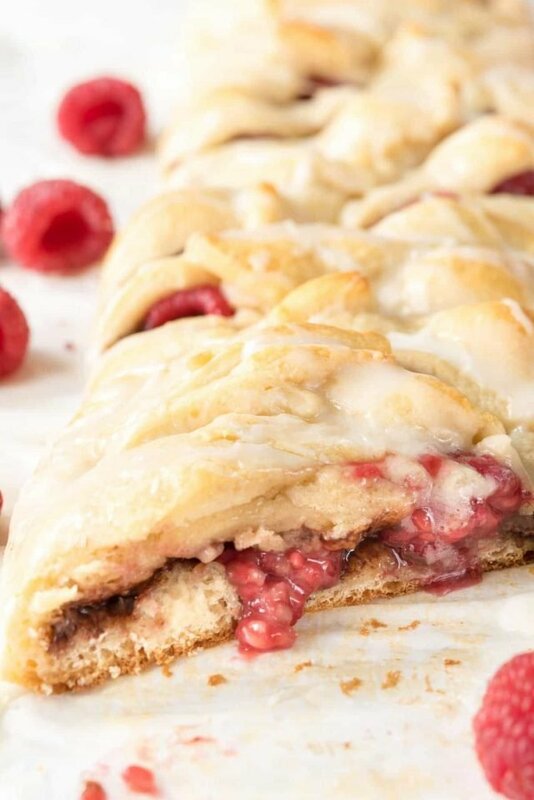 Raspberry Nutella Danish is another way to use up raspberries! 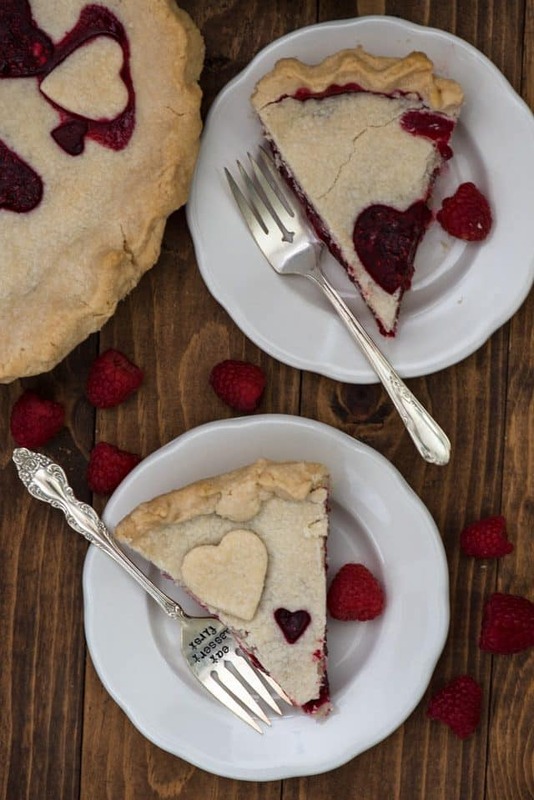 Make a Crazy Crust Berry Pie with raspberries! Oh boy ! Pinned to holidays ! You make my day 🙂 Thank you ! Gotta love a straightforward, beautiful berry pie recipe! Can’t wait to try, pinned!